OK. 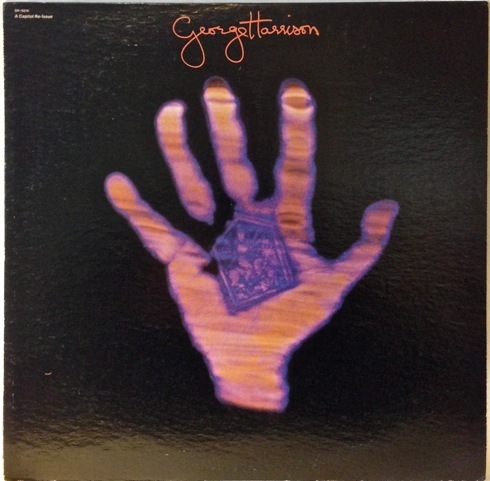 In Part One I detailed the four main record stores I was able to visit while in San Fran. Now some detail on what I found and brought home to join the collection. 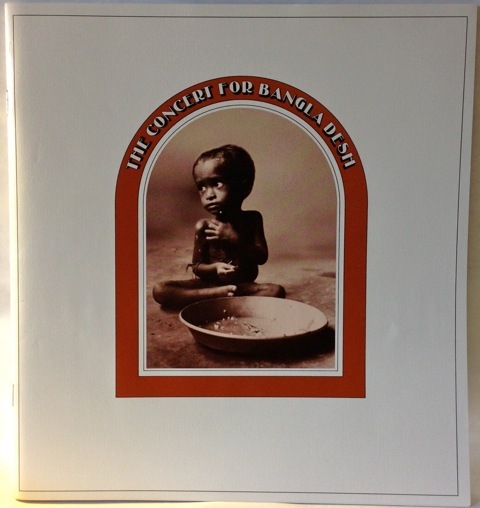 Firstly, the vinyl. 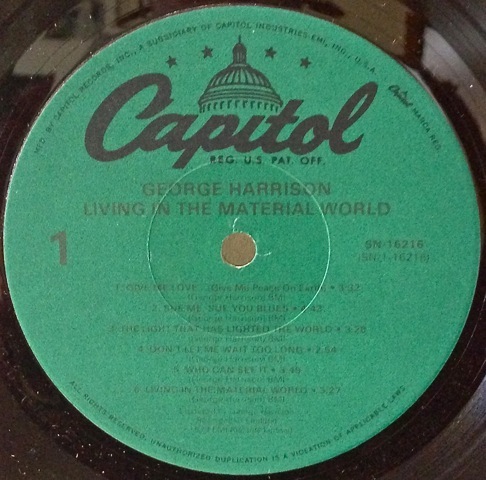 At Rasputin Music on Powell (near Union Square) I found a very clean copy of George Harrison’s Living in the Material World. 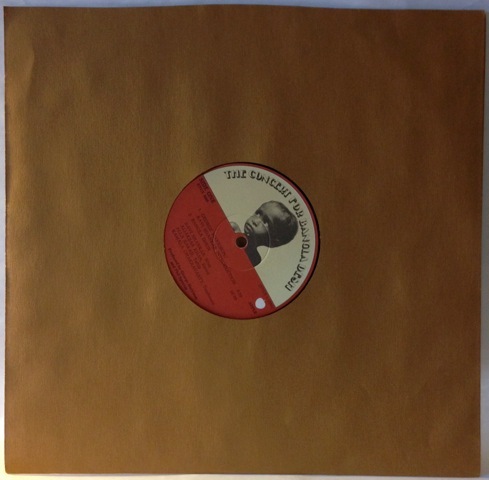 It was a US pressing I didn’t have – a budget re-issue on the green Capitol label: As you can see, it’s a nice clean copy and the vinyl is mint. Later in the week I got over to the Haight-Ashbury district were there were three stores in close proximity (Recycled, Rasputin and Amoeba – all on Haight Street). 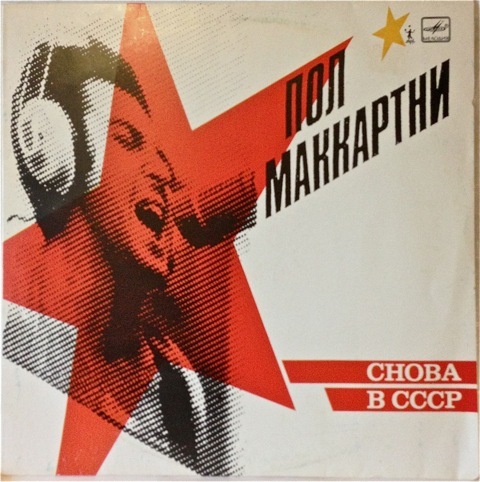 The first I visited was Recycled Records. They had some vintage Beatles LP’s, but to be honest they were fairly expensive….and so I concentrated on the Beatles as solo artists. 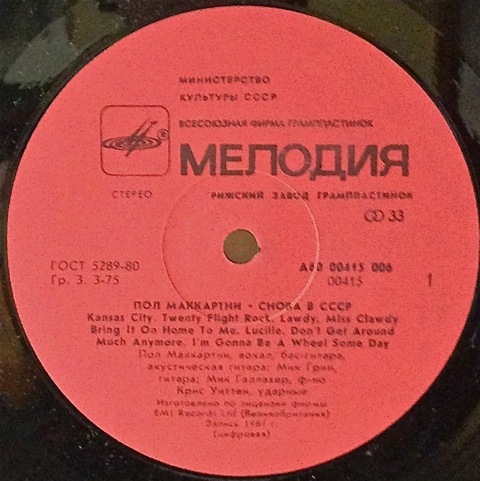 I’ve always been keen on collecting variations of Paul McCartney’s “Russian” album called Choba B CCCP. Well, Recycled was a bit of a treasure trove as they have numerous copies in their bins and tucked away underneath on shelves. 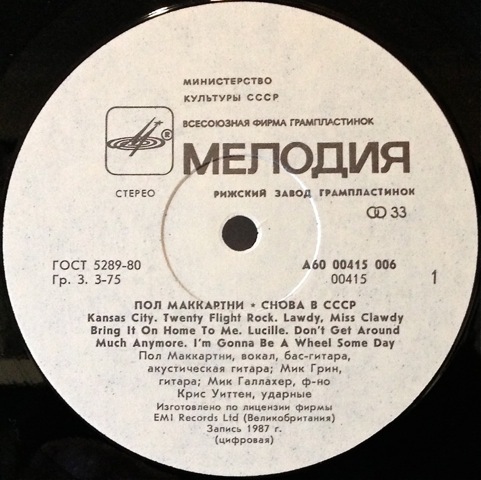 There were thirty to forty copies in all, and so I set about identifying some versions I didn’t have. 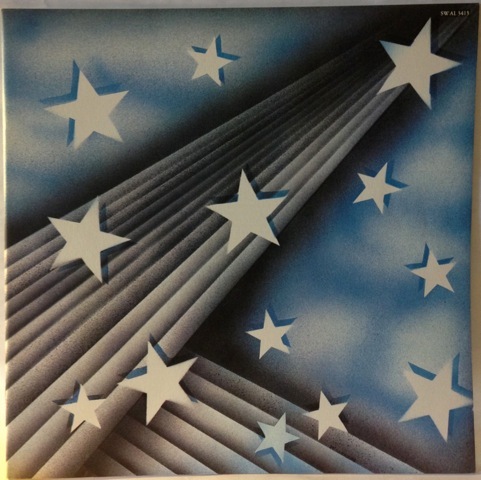 There are so many variations of this particular record because it came out firstly as an 11-track album, followed later by a 13-track version. 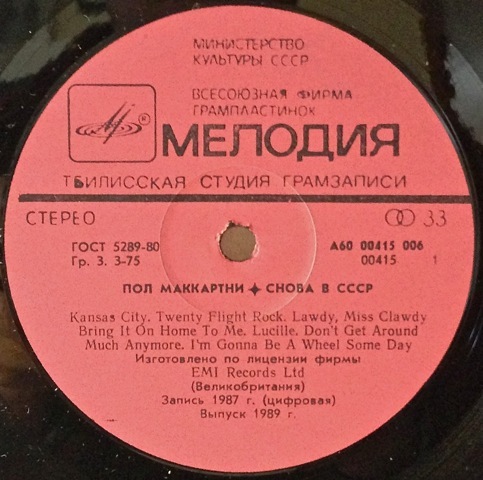 And they were pressed in about six different Russian pressing plants, each with its own label styles and variations (sometimes subtle) within those labels. 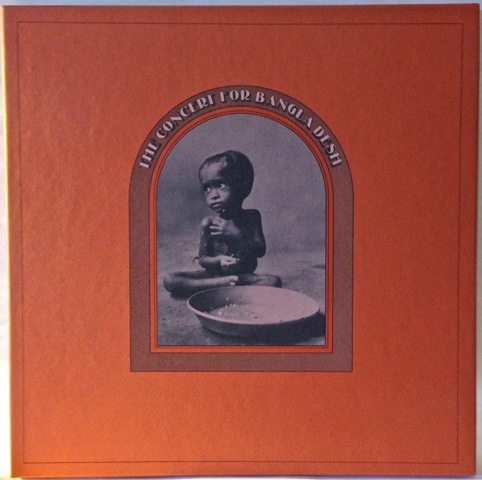 I turned up four distinct copies I wanted, and they were all very reasonably priced (between US$6.00-$10.00 each). 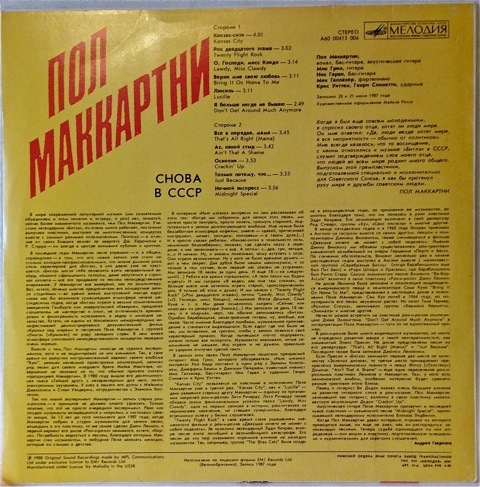 There was one 11-track version (from the Aprelevka pressing plant), two 13-track versions (Tbilisi plant and Riga plant), and one “hybrid” that had an 11-track cover but a 13-track LP inside (which I didn’t realise until I got home). 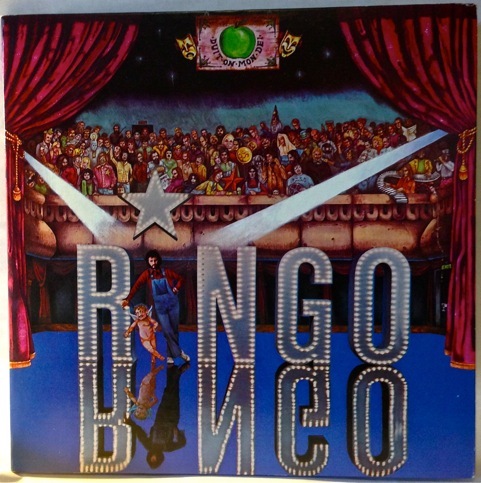 Both the cover and LP are from the same factory (the Riga plant) so I’m not sure if this is legit or just a mistake…. 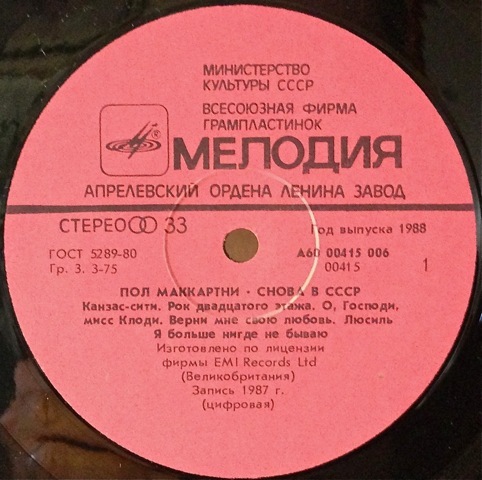 Of course for the full detail on all Russian Beatle and Beatle-related vinyl releases you need to visit this one, fantastic central repository. 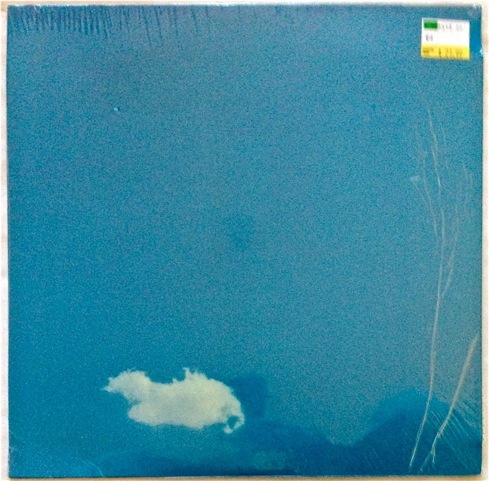 I think this re-issue was released in 2012 through a company called Hi Horse Records (which is a subsidiary of City Hall Records). 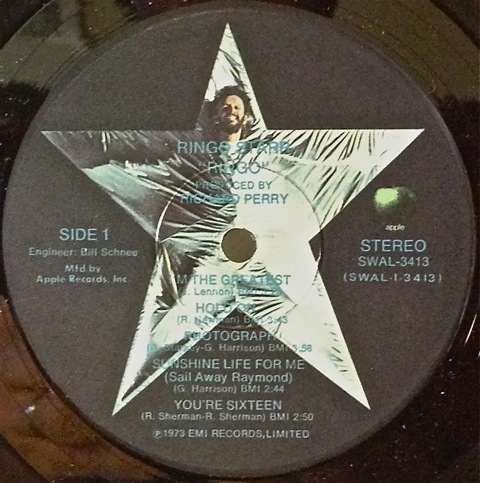 It’s on the original Apple label and has the same SW 3362 catalogue number. If anyone has any other info on this one it would be very welcome. Please drop us a line. So, that was a quick summary of the vinyl found in four San Francisco record stores during a short visit there last week. Next time a look at the CD’s and DVD’s I found and added to the collection. 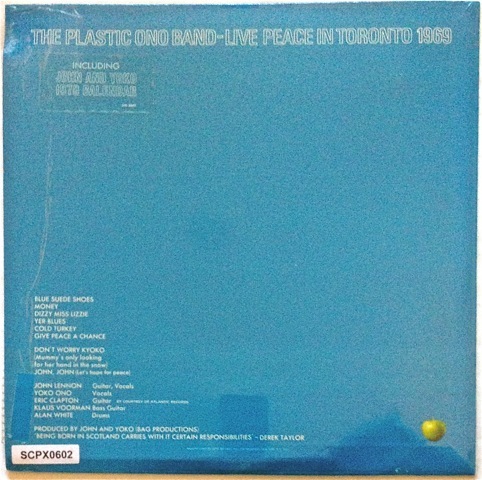 This entry was posted in Apple Records, Beatles, Beatles Collecting, Beatles Music, Capitol Records, George Harrison, John Lennon, Paul McCartney, Ringo Starr, Russian Beatles, Yoko Ono and tagged apple label, Apple Records, Beatles, Beatles Collecting, Beatles Related, George Harrison, John Lennon, Klaus Voormann, Living in the Material World, Music, Paul McCartney, Plastic Ono Band, Ringo Starr, Yoko Ono by beatlesblogger. Bookmark the permalink. 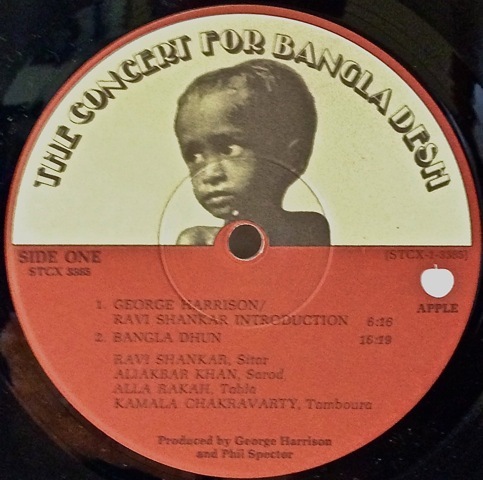 Great LPs adds….wonderful to find a copy of the Bangalesh that had the full 64 page booklet in it. 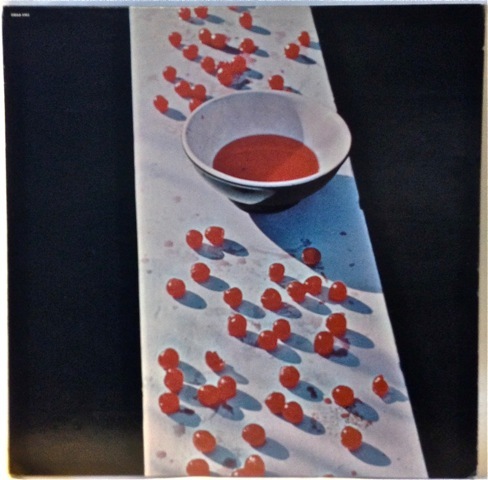 I have all my old Beatle (and post Beatle LPs still…I am an older reader who started my vinyl collection back in the 50’s – so I have first day releases of almost every Beatle LP. Curious if you were in LA at all while here??? 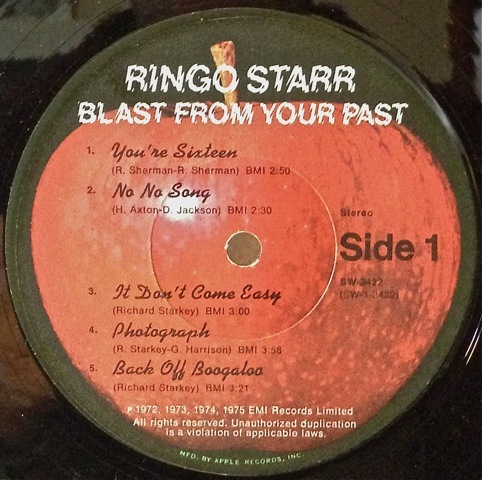 The Ringo exhibit going on now at the Grammy Museum is really good – you would have loved to have seen it I am sure. His original Sgt. 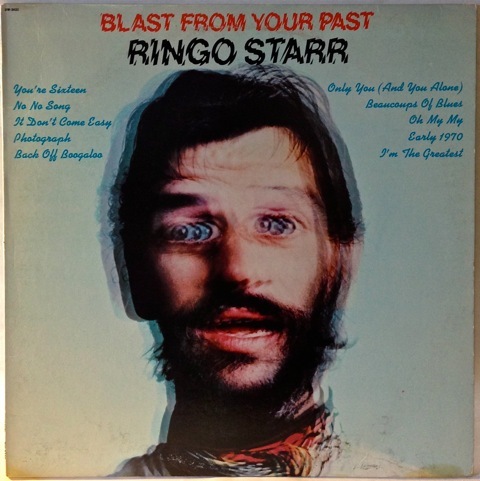 Pepper pink suit, lots of other original iconic clothing – taking drum lessons from Ringo himself via video and headphones with dampened electronic full drum kits and on and on…it really was great. They had 3 full original drum kits of his there including the black pearl kit used on the Ed Sullivan shows and also on most of the 64 world tour…that was fun to see. Made me feel OLD! 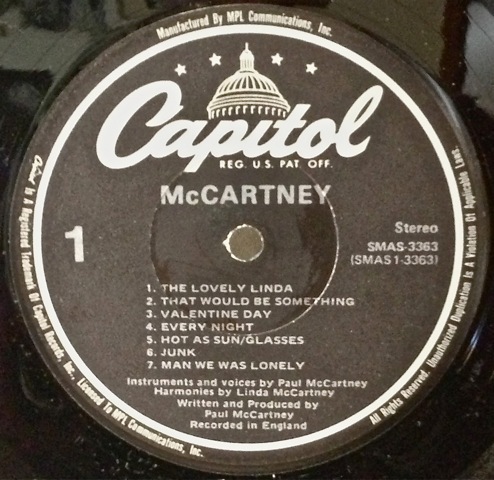 Forgot to say McCartney is been one of my all time favs of his for eons…he played all the ins. on it and it was paired down – really clean..it was huge when i came out. 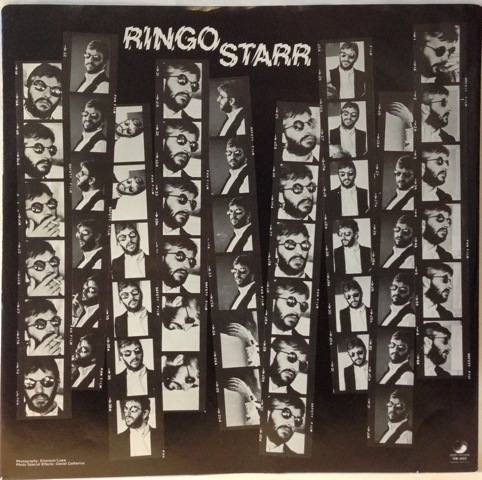 have you seen the old Ringo video he made atop the Capitol Record bldg in Hollywood for Goodnight Vienna? Do look at it on YouTube…I was there for the shoot – er part of it and down the hallway since only a couple folks at any time could be on top of the Capitol bldg. That suit he wore in the video is also on display at the Grammy museum…was a trip to see that and also the duds he wore on the roof top concert for the Let It Be Sessions at Twickenham Studios. http://www.youtube.com/watch?v=zqBH-9yyQMU – that’s a start for you – that’s the commercial John did for Ringo for theGoodnight Vienna LP where there are a couple videos with Ringo in his space suit on top of the capitol records building…there is one I am not finding looking really fast on Youtube right now where it was really windy and Ringo spends the whole song up on the top of the bld and they aimed lasers at him from other blds and the parking lot near by the Capitol blg…. 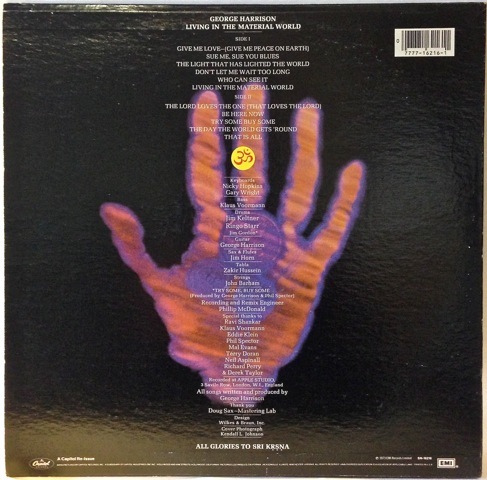 will have to spend some time looking at all the tracks on YouTube to find the right one from that LP I am thinking of…it might be the Only You one but that has cuts to John walking along.